Business plan for an organization is the document which determines the organizational objectives, strategies and projected actions in order to promote its survival and development within a given time frame. Business plan also focuses on two key aspects namely (i) dealing with risks, and (ii) making profits. Business planning process requires deep investigation, careful evaluation of all factors, which might have an impact on the result, and study of possible results of the actions of the organization. In addition business plan determines management actions for expansion process, designs new ways of for management action and includes revision of all the operations of the organization. Business plan enables organizational management to demonstrate to stakeholders, including founders and investors, that there is potential for considerable growth of the organization in a large market. It also illustrates that the organization is capable of achieving significant market power with a sustainable and differentiated product or service offering. Business plan consists of a comprehensive, written description of the business of the organization. It is a detailed document describing the products or services of the organization, production techniques, markets and customers, marketing strategy, human resources, organization of important activities, requirements in respect of infrastructure and supplies, financing requirements, and sources and uses of funds. Business plan describes the past and present status of the organizational business, but its main purpose is to present the future of the organization. It is normally updated frequently and looks ahead for a period of three to five years normally, depending on the type of business and the kind of the organization. It is a crucial document needed for getting funding support from financial institutions and hence it is required to be complete, sincere, factual, well-structured and reader-friendly document. There are several reasons for the preparation of a business plan. Some of these reasons are described below. Getting an integrated view of the business – Business plan provides an integrated view of all issues about the business of the organization. It helps to identify the target customers, outline the market segment, shape the pricing strategy, and define the competitive conditions under which the organization is to operate in order to succeed. Business plan ensures that all of these considerations are consistent and properly harmonized. Also, the process of developing the business plan process often leads to the discovery of a competitive advantage or new opportunities as well as deficiencies in the plan. Business plan document ensures improvements in the overall ability of the organizational management in managing of the business. It also guides the organizational management where to concentrate the efforts in case of any deviations from the plan before conditions become critical. It also helps to look ahead and to avoid problems before they arise. Mutual understanding within the management team – Business plan helps in the achievement of the mutual understanding among the members of the management team since during the business plan preparation these members have been associated in its preparation. Determining financial needs and arrangement of funds – Business plan makes the organization determine the amount, its time of requirement, and the type of finances needed. It demonstrates that the opportunity available with the organization is a good investment deal. Hence the business plan helps in taking decision about investments to be made as well as on the sources of financing. Approval from board of directors – Business plan since it is approved by the board of directors of the company, provides the management in principle approval for the future action plan for the organization. Provides clarity and direction – Business plan provides the management clarity and direction for taking decisions. It provides the basis for the monitoring of the performance. It helps in deriving objectives for the employees and departments as well as in the staffing function of the management. It also informs/motivates the employees about the objectives of the organization. Business plan since it includes value-enhancing milestones and a realistic valuation; it enables the investors to achieve their target return on investment. The plan is also outline a clear exit strategy. Further, the good practice of business planning process is to include in the business plan the long-term objectives. A good business plan also have future thinking since a successful organization is needed to invest in future and do not seek only short term success. The exercise of developing and writing a business plan provides the organizational team members with the opportunity to organize their collective insights about the organization and, the business opportunity, as well as how they plan to achieve the objectives. The business plan is the product, but the planning process is more important. Planning, tracking, reviewing and setting goals, and executing on the plan, are the foundation of running of the organizational business. Business planning is the process of determining the organizational objectives, strategies and projected actions in order to promote its survival and development within a given time frame. It mainly focuses on two basic features which deal with risks and making profits. The different concepts used during the business planning process are described below. Vision statement – It is a global concept presenting a picture of the direction, future and philosophy of the company. The vision statement is required to remain firm and is not to be influenced by the concerns of the organization. The normal time frame of vision statement to remain firm is around 10 years to 20 years. It presents the long term goal and objectives of the organization. Vision statement is an important part as it sets the primary direction for business planning process. Mission statement – Mission statement represents the main purpose and principles which guides the actions of management, partners and employees. Further, it includes the strategy, which is required for the achievement of the organizational goals and objectives, defines the target groups and embodies the values of the organization. Business plan introduces the road map of the organization, where mission plays the role of providing the guidelines to follow. Vision statement sets the direction, while mission statement shows the way to achieve it. It is important to be sure that the business planning process is consistent with the mission of the organization as otherwise, the desired goals and objectives the organization are not likely to be met. Statement of purpose- It shows ‘what’ the organization wants to perform and achieve. When the purpose is being defined, the person is to remain focused on results and problems which he seeks to facilitate. Business statement – It is regarding ‘how’ the organization wants to achieve its purpose by presenting which actions are to taken. It represents the business strategy. Value statement – This statement of the mission identifies ‘who’ by including the main principles and beliefs of the organization. Value statement leads employees to the approach, how tasks are to be implemented. It has a strong influence on decision-making process. Further, it helps to predict how the employees or management are likely to behave in different situations, which is essential for business planning process. Problem statement – This statement represents the ‘why’ of the organization and states the problem which is required to be solved. Customer statement – It defines ‘for whom’ of the organization. It identifies the target audience as well as the main strategies to reach the target group. To ask ‘for whom’, it is necessary to find an answer to such questions as ‘where are they located’, ‘how to reach them’ and ‘what needs have they stated’. Mission statement plays an important role in the business planning process since it represents the path for achieving goals and objectives and values of organization. Objectives – The objectives of business plan represent the end result and take the role of quantitative measures within fixed time frame. The fixed time frame for the achievement of the objectives corresponds with the goals which are set in the mission statement. The business plan shows strategies for reaching the objectives and hence, it meets as well the viability in the mission statement. The main rule about setting objectives is that they are to be well-defined and clearly stated, realistic, relevant, time-based and quantifiable. Further, objectives are to be cost recovering, profitable and cost efficient. The objectives are to be achievable, what means that inconsistent objectives need to be avoided. Objectives in business planning process are the reflection of mission statement. Objectives show the end desired result, which means if the result is not reached, mission statement is required to be changed. Action plan – Action planning is the essential part of business planning process since it describes the path to the achievement of the objectives and put everything in a good order. Action plan is the detailed plan which includes actions required to be taken for the achievement of the objectives. It is a useful tool of the business planning process since it identifies and sets clear objectives, prioritizes tasks in the efficient way and states strict deadlines. Further, it lends credibility to the organization and does not allow overlooking of some of the essential details. Action plan consists of a cycle of five stages namely (i) identification of current situation, progress and implementation of self-assessment, (ii) setting of goals, (iii) definition of the strategy which is required to be performed in order to achieve the results (the strategy is sometimes detailed to include smaller discreet steps), (iv) taking of the action, and (v) evaluation of results. Once this cycle is completed, the process starts again with identification of current situation. During the process of action plan preparation, it is important to ensure that it contains clear objectives. The objectives are required to be simulative, but not too challenging as, otherwise, the result is not achieved. Apart from that, action plan is to be relevant to the prevailing environment. Action plan prepared well in advance may not represent current situation. Further, all the steps in the action plan need to be clearly defined since all the steps are significant part of action planning process because the organization may not achieve desired target if steps are vague. Steps are also to be arranged in logical and chronological sequence and evaluated each time as it helps in monitoring of the process and its efficiency. In order to minimize risks, it is worthwhile to create several strategies which can substitute each other if one of them stops working. In fact, the action plan is to be very flexible. Action plan as any other plan includes resources which are represented by people, finances, materials, services and transport. When the organization makes a decision on what inputs are required, it is important to ensure that they are adequate to achieve goals. Also, all the activities need to be carefully budgeted. The process of budgeting and resource allocation can be based either on previous experience or costing exercise. Business plan of an organization is required to present the company’s overview which includes its mission, visions, and objectives, key principles of business planning; structure of business plan, and the PDCA (Plan-Do-Check-Act) strategy as a part of business planning process. 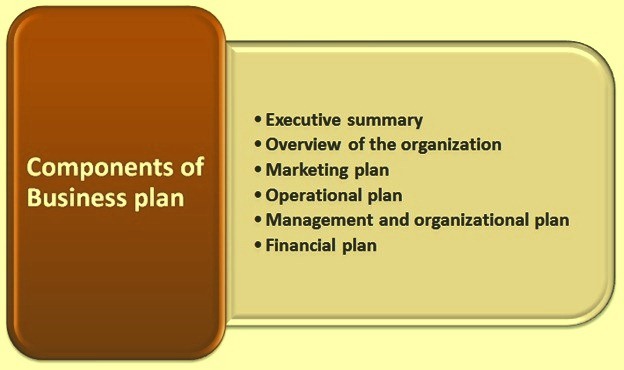 The main components of business plan are (i) executive summary, (ii) overview of the organization, (iii) marketing plan, (iv) operational plan, (v) management and organization plan, and (vi) the financial plan. These components are shown in Fig 1. Executive summary – It captures the most important components of the business plan and plays a role of a quick reference. It is to be readers friendly and its length is not to exceed two pages. It includes the short description all the components of the business plan. It is to highlight planned targets, strategic steps for the achievement of the targets, opportunities and risks. Overview of the organization – Overview of the organization describes in short the present status of the organization. It is to include vision and mission statements, objectives, products and major customers, capacities, raw materials, facilities, human related information, certifications, turn over, and profit and loss statements etc. Marketing plan – It is one of the major and extremely significant part of the business planning process. Marketing brings success in the long term, particularly, continuous growth in earnings. Elements of the marketing plan are product mix, four Ps of the marketing (product, place, price and promotion), branding strategy, competitor and market analysis, Porter’s five forces analysis (Porter’s five forces consists of bargaining power of suppliers, threat of new entrants, threat of substitute, bargaining power of buyers, and competitive rivalry), SWOT (strength, weakness, opportunity, and threat) analysis, customer decision making process, and sales plan. Operational plan – It includes daily operations, people, processes, equipment, waste generation and recycling environment and safety. Operation plan plays an important role because it clarifies all aspects of business and structures them. Operational plan include production targets, raw materials, equipment and spares, maintenance and upgradation plan, personnel planning, training and development of employees, inventory planning, waste planning, environment and safety related plans and regulatory issues. Operational plan is also to include product quality, product development and activities related to process development. Operational plan is a useful tool, which facilitates the coordination between various departments of the organization for achieving goals and objectives. Also, this plan allows evaluating the amount of expenses needed for efficient functioning of the organization. Last but not least, operational plan is a guideline for the whole organization, and it explains specific strategies and actions which are needed to be taken on a daily basis. Management and organization plan – It analyses the structure and hierarchy within an organization. This plan includes the information about board of directors and management, consultants and key advisors. Apart from that, it displays the responsible area of employees and proposes a succession plan. It allows clarifying the responsibilities of the employees and management of the business on a daily basis. Financial plan – It evaluates current financial situation of the organization and predicts the future financial performance. One of the objectives of the financial planning is to determine capital requirements and capital structure in order to understand the financial state of the business. Apart from that, financial planning process frames financial policies to control the cash flow and ensures that the organization is utilizing its financial resources in the most efficient way. In addition to it, financial plan is also to show the direction of the organizational activities and analyses how each action influences at the financial stability. Last but not least, financial plan helps to make a decision about investments as it displays the ratios (e.g. equity ratio, debt ratio) which plays an important role in the decision making process. Financial plan is to include (i) profit and loss projection, (ii) projected balance sheet, (iii) projected cash flow and the break-even analysis.